Enlarge View 9 images in sequence. - Vol. I, no. I (September 12, 1942)-vol. IV, no. 69 (Sept. 5, 1945). - Published at the Gila River Relocation Center by the War Relocation Authority. Gila News-Courier . Rivers, Arizona, October 5. (Rivers, AZ), Oct. 5 1943. https://0-www.loc.gov.oasys.lib.oxy.edu/item/sn83025353/1943-10-05/ed-1/. 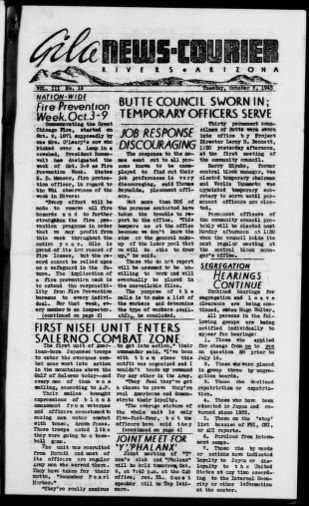 (1943, October 5) Gila News-Courier . Rivers, Arizona, October 5. Retrieved from the Library of Congress, https://0-www.loc.gov.oasys.lib.oxy.edu/item/sn83025353/1943-10-05/ed-1/. Gila News-Courier . Rivers, Arizona, October 5. (Rivers, AZ) 5 Oct. 1943. Retrieved from the Library of Congress, www.loc.gov/item/sn83025353/1943-10-05/ed-1/. General view of dairy, office building and dairy stock pens at Casa Grande Valley Farms, Pinal ... 1 negative : safety ; 35 mm. Dairy cattle and shelters at the Casa Grande Valley Farms, Pinal County, Arizona 1 negative : safety ; 35 mm. Dairy cattle eating while being milked, Casa Grande Valley Farms, Pinal County, Arizona 1 negative : nitrate ; 35 mm.